A climbers' miniverse just 500 feet from 7th Avenue. Hello. My name is Lester LeBlanc. Well … not really. I used that name back in 1988 when I wrote A Climber’s Guide to Popular Manhattan Boulder Problems. I used the name because I couldn't stop thinking that some hapless climber would attempt to solo one of the routes at Belvedere Castle and rescue workers, police or park rangers would find a copy of my guide in his back pocket as he lay dead and bleeding. My cunning plan was that the authorities, as they say, would come for Lester LeBlanc and not me. It hasn’t happened yet, but let me reiterate, I’m not responsible for any actions, legal or otherwise by any climber in New York City. Okay. Now that we got that out of the way, let’s get down to it. ACGTPMB was mostly written during a two week long heat wave in the summer of 1988. In 1988, there were no indoor climbing walls. The first American 5.14 was still two years off. The only boulder rating system was the John Gill B scale. Rap-bolting was considered by most American climbers to be the ethical death of the sport. Climbing still had a few years to enjoy itself as a fringe sport before being dragged into the mainstream by indoor walls, sport climbing, competitions and ESPN. I was not the first person who thought about writing such a guide. When I first entered the climbing scene in New York, I talked to half a dozen people who had planned to write a guide for the city. A year later, the guide remained unwritten. I resolved to take on the task myself. When the heat and humidity of August descended, I spent several weekends in the air-conditioned offices of the film restoration lab where I worked, typing all the pages. Then I spent the next three hot, sticky days roaming the parks of New York with my Nikon FM. How did I come by all this arcane knowledge of small schist outcroppings in Manhattan? To answer that question properly we need to flash back to 1986. Dumped by my college sweetheart, I had become increasingly fascinated with the prospect of living my life on an icy ledge 23,000 feet above sea level. I had seen an Everest documentary about Chris Bonnington’s successful expedition up the southwest face and I was subsequently and totally hooked. But where to start on my adventure to the roof of the world? As they say in the movie business … CUT TO: Central Park. One Year Later. A pair of Fires, a chalk bag and some painter’s pants and I was suddenly a “climber.” Although I began my scrambling at Vista Rock beneath the picturesque Belvedere Castle, I soon realized that the squat boulder adjacent to the children’s playground in the southeast corner of Central Park was where the real climbers practiced their craft. These had to be real climbers, I thought, because they climbed no more than three or four moves in a row and the rest of the time they sat, smoked cigarettes and stared at the rock. I stayed away from that scene as long as possible. Eventually, curiousity and desire overwhelmed my reluctance . Also, I had exhausted all the decent, safe bouldering at Vista and was faced with lousy landings if I was going to get onto anything new. That is how I became a Rat Rocketeer. What followed was five wonderful years of urban cragging with a growing roster of local climbers. 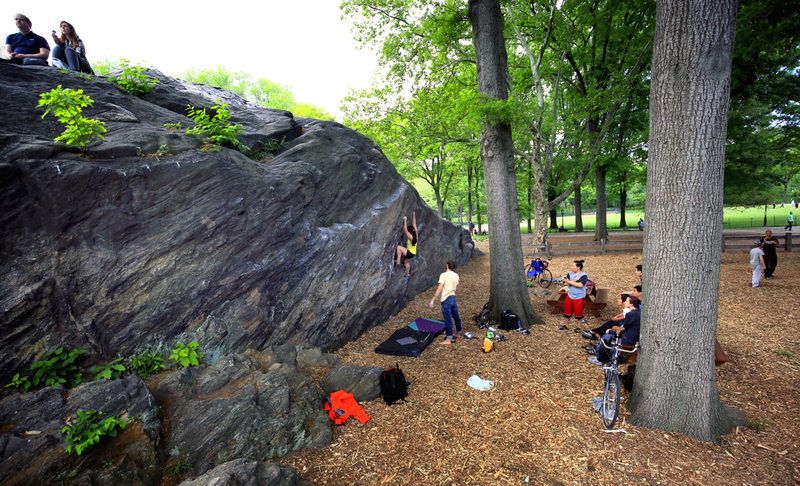 Through the intensity, passion and talent of individuals such as Koma, Yuki, Jeff Dahlgren, John Blumenthal, Chris Gonzalez, Jean DeLataillade and many others, Central Park evolved from an arcane, somewhat sleepy bouldering area into a true proving ground with standards being pushed higher almost every month. It was this energy that opened up the future. Problems that were previously viewed as impossible were attempted ... and climbed. It started with the desire to reestablish the old Rat Rock testpiece, “5.11 Direct” (which quickly was turned into a 5.12 testpiece). From there, it moved to the steep, blank middle face of Cat Rock, and everything previously ignored or dismissed at Rat Rock. This was the era that produced Rat Patrol, Koma’s Roof, Bottom Line, Exterminator, Private Angel, Elias and The Dawg. *Yuki has since gone back to his family in Japan, leaving Rat Rock without its sensei. And without a living, oral history and guidebook. Anyone who had a chance to climb and talk with Yuki while he was living, working and climbing in New York should consider themselves lucky. Around the same time, Ralph Eerenzo and I sat in front of Rat Rock and dreamed up something called the City Climbers Club so that we could get the Park Enforcement officers off our backs once and for all. I became a member of the Rat Rock family and grew to value the reception of friendly, familiar faces that greeted me on every arrival. Climbing opened up a whole new world to me and the boulders in Central Park became my new home. That summer of 1988, Kevin Bein and Fritz Weissner died. Climbing had given me so much in so short a period of time. I wanted to give something back. And fifteen years later, so much has changed. But those gnarly little boulders are still there. And I remember them with great fondness and appreciation. Those gnarly little boulders gave me (a young, callow urban lad) a sense of outdoor adventure and provided me with my first intoxicating taste of climbing. And so, this guide is dedicated to all the climbers of New York City who have invested the time in discovering the pleasures of Central Park bouldering.